« Lovin’ lobster land: the Brizzis’ annual pilgrimage to good places to eat. Spiced butter (niter kebbeh), the irresistible foundation of Ethiopian cuisine. Since I first became interested in Ethiopian food I’ve been oddly captivated by the photo on the left, a tripe stuffed with a spicy mix of chopped steak, toasted bread crumbs, and exotic spices, topped with a golden buttery spiced gravy. But it’s been a long road. 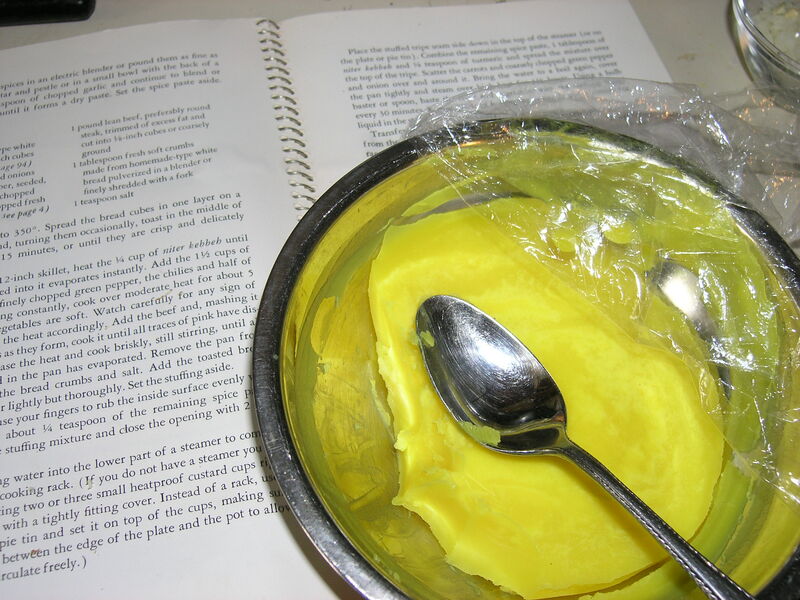 The photo in my copy of Time Life’s Foods of the World: African Cooking had no accompanying recipe; for that you had to use the spiral bound index that shipped with the book in 1970. And which I didn’t have, and couldn’t find. Until a couple of years ago when my online hunting finally paid off. 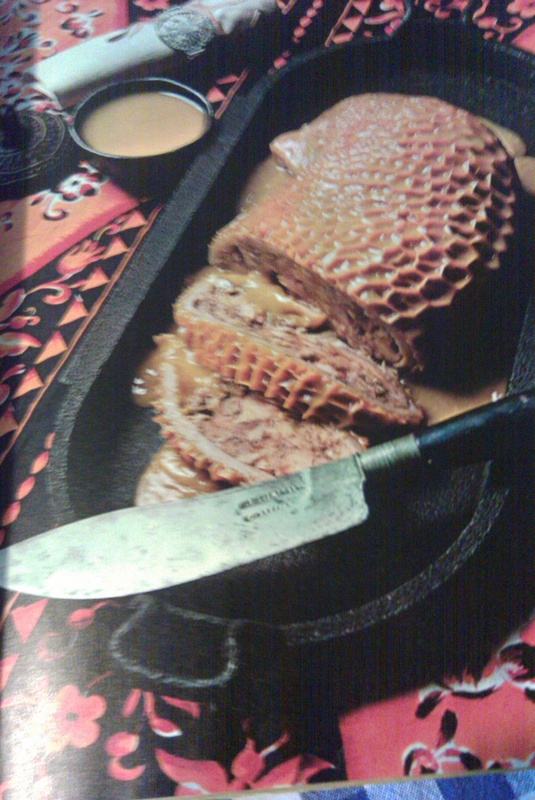 Then it was the whole three-pound cow’s stomach that proved elusive. Most tripe I buy once a year or so for a luscious Trippa alla Fiorentina comes in oddly shaped pieces not suitable for stuffing. 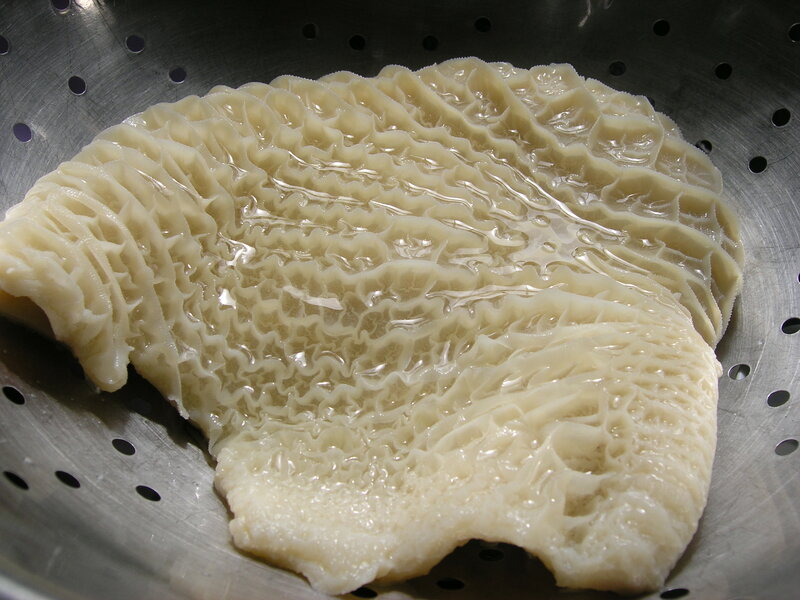 But fate would have it that I found a perfect piece of tripe at Hannafords recently, not 3 lbs. worth, but a one-pound pouch, so I could do a third of the recipe. So I was off and running. 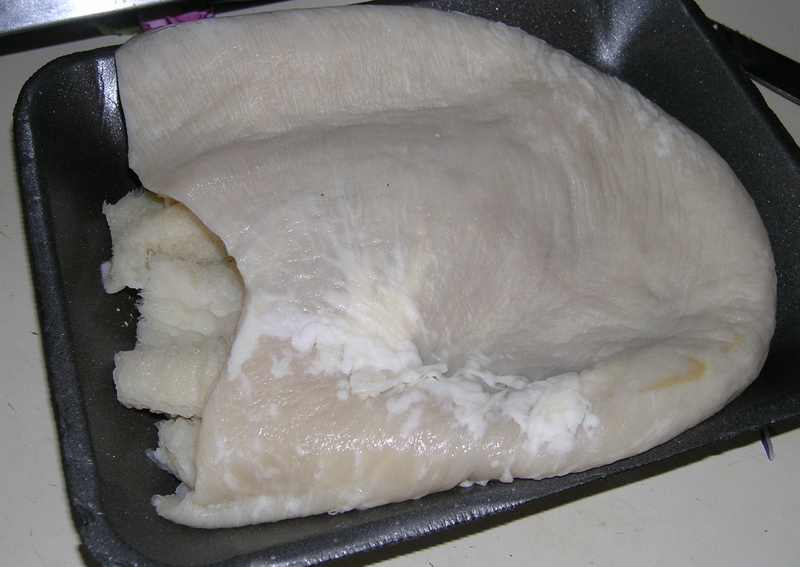 The one-pound tripe pouch before cooking. I turned the pouch inside out and boiled it for three hours until it was tender at knifepoint, then drained it and tried to dry it off as best I could with paper towels. Meanwhile I prepared the stuffing by sauteing chopped onion, green pepper, and a serrano chili in niter kibbeh, the foundation of much Ethiopian food, a clarified butter spiced with garlic, ginger, onion, turmeric, cardamom, cinnamon, and other spices. I added some chopped up round steak and a bit of a spice paste made with crushed garlic, pulverized peppercorns, allspice, clove, cardamom seeds, fenugreek, and nutmeg. 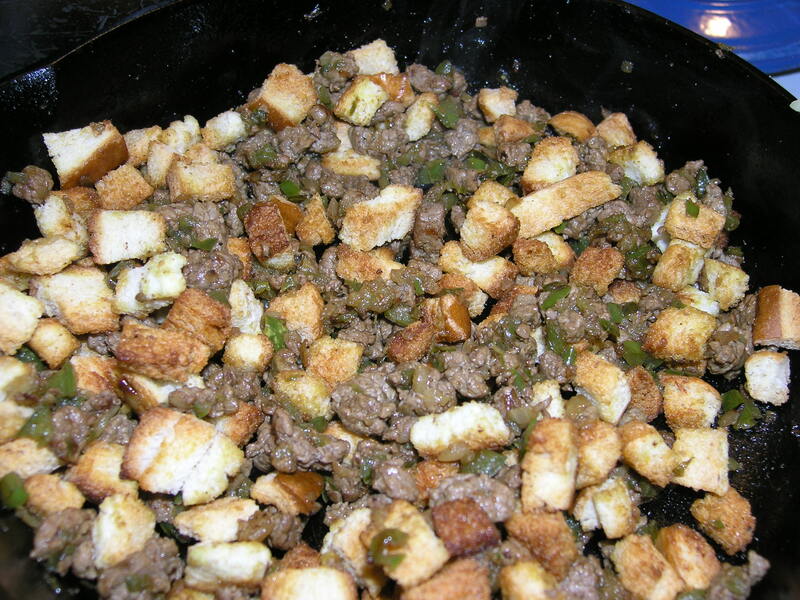 After the meat browned, in went some salt, a touch of soft fresh breadcrumbs, and some toasted little cubes of Pepperidge Farm white bread. Then into the beef belly it all went, to be trussed up with skewers and gently placed in a deep pasta bowl with some chunks of carrot, onion, and green pepper. I dolloped the top with some more spiced butter and then with a bit of difficulty I set it up to steam (thanks, Calico, for the birthday silicone steamer!–although I doubt you would approve of my first use of it!). 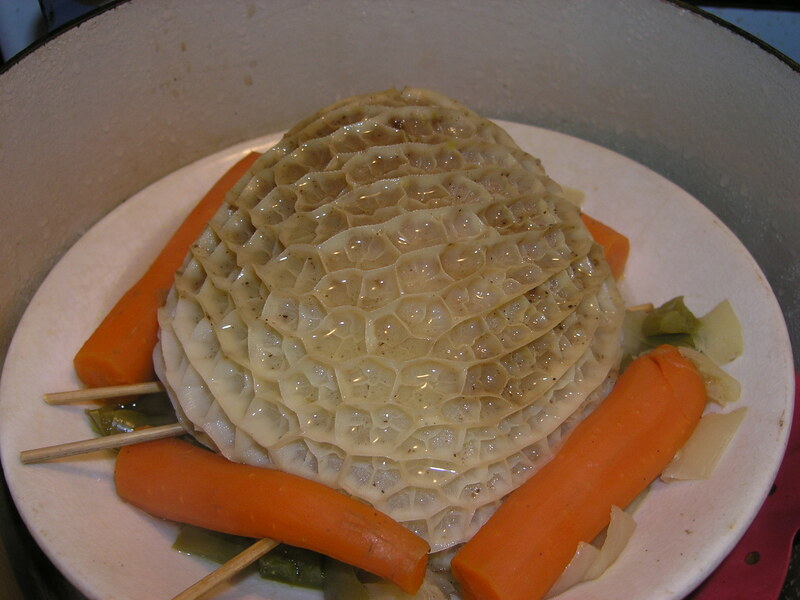 The tripe, all stuffed and ready to go. Back view. Or is it the front? 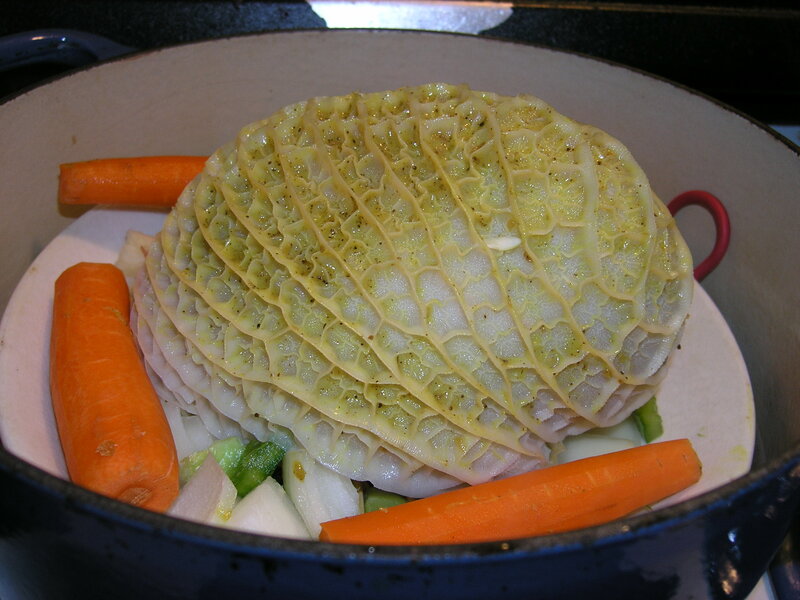 After 1 1/2 hours of steaming and basting, the stuffed tripe was ready. My husband had to get our son to baseball practice and couldn’t wait for the sauce to be made, so he dug right in (BTW, this wasn’t dinner, for that I made arroz con pollo). 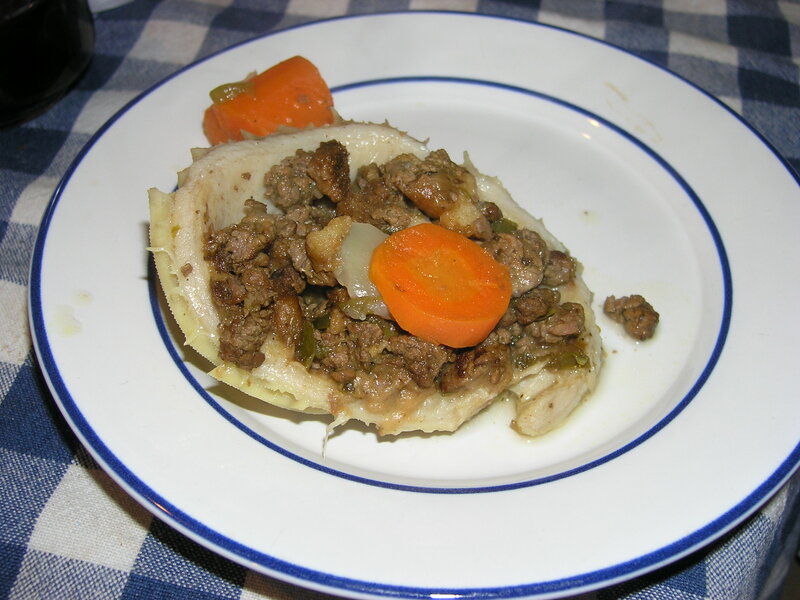 The first slice of stuffed tripe, fresh from the steamer. 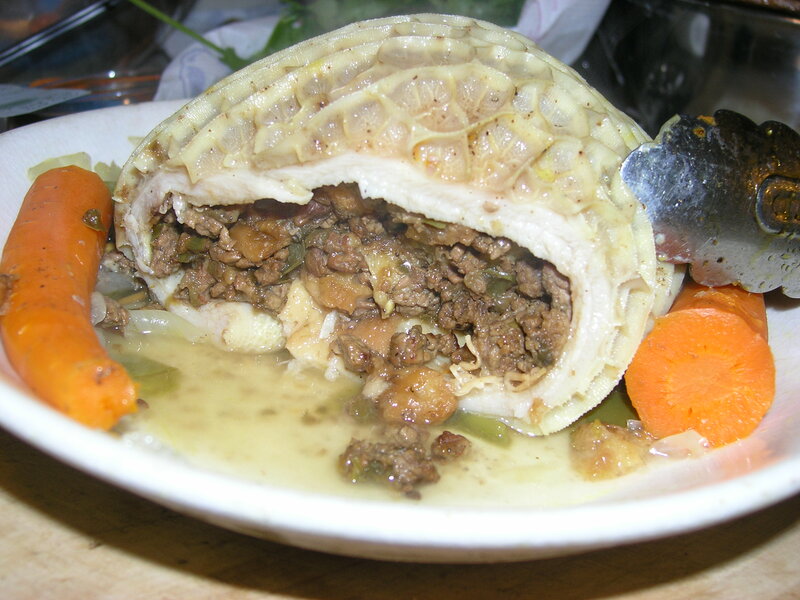 A fine slice of stuffed tripe. I got to enjoy my own portion a few minutes later, gilded with the buttery gravy. And it was wonderful, hearty, zippy, and flavorful. 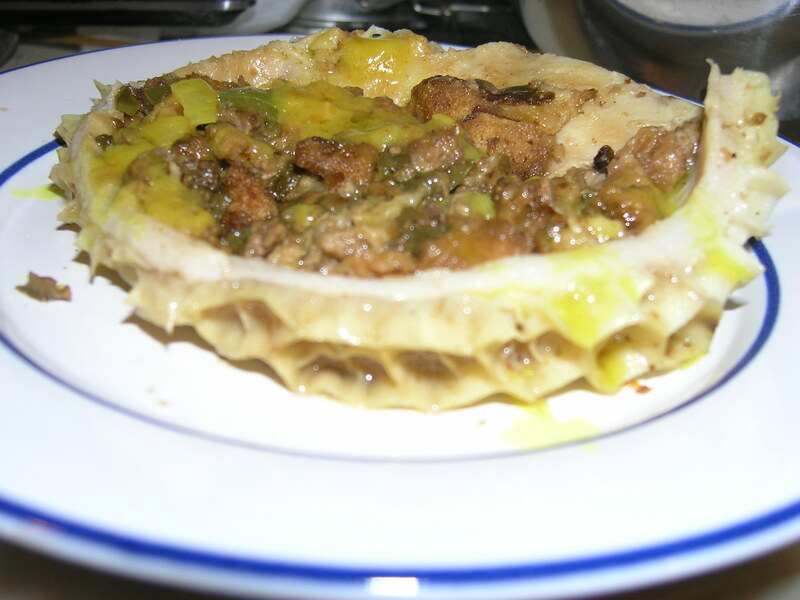 If I ever happen upon another tripe pouch I will make it again.